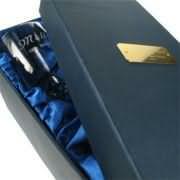 Engraved gift ideas anniversaries are things that people will keep for ever and enjoy the quality engraved glassware. Engraved Father of the Bride Whisky Glass. 24% Lead Crystal Whisky Tumbler standing approx 8cm tall and fully engraved at no additional cost.